Har­ry Pot­ter and the Sorcerer’s Stone, the first book in the Har­ry Pot­ter series, came out a few months after Child #1 was born. In my sleep-deprived stu­por, I didn’t notice for awhile; but it quick­ly became dif­fi­cult to be a cit­i­zen of the world and not know about Har­ry Pot­ter. Suf­fice to say, the first four books were in the house by the time that baby boy went to school, which is when and where he found out about Har­ry and friends. The requests to read the books became more fre­quent and insis­tent over the next cou­ple of years. We stalled. We tried to use the books as a bribe to get him read­ing inde­pen­dent­ly (nev­er do this—it doesn’t work and it’s ter­ri­ble par­ent­ing). He was anx­ious to get caught up in time for the #5 release—the mid­night releases/parties/mobs were well under­way by then—and it start­ed to feel like we were mak­ing an issue of some­thing that didn’t need to be an issue. We weren’t trou­bled by wiz­ards and mag­ic. We were thrilled with the themes of friend­ship and the explo­ration of the sub­tleties of good­ness and evil in the books. So what was our prob­lem? Only that the books seemed a lit­tle old for our sweet and gen­tle lit­tle boy—they get pro­gres­sive­ly dark­er as they go, after all. We were anx­ious about intro­duc­ing him to “more mature books” too soon. (First child, remem­ber.) But cul­ture clam­ored and he was get­ting left out because he didn’t know about Har­ry and Ron and Hermione, couldn’t attempt the spells on the play­ground, and didn’t catch the Dum­b­le­dore ref­er­ences. And by then, due to the hype at home and every­where, Child #2 was inter­est­ed in Har­ry Pot­ter. She was an ear­li­er read­er and could have picked up the books on her own, but she assumed that Har­ry Pot­ter was the book series you read with Dad! She is almost twelve now and she and her Dad are fin­ish­ing #7 this sum­mer. They’ve aver­aged about a book a year. I don’t believe she has read ahead, which I think is kind of amaz­ing. A good friend just asked me if kids can grow up with­out read­ing Har­ry Pot­ter. (She was inclined to skip the series, not being a fan her­self.) I said they could, of course. Many fam­i­lies make that deci­sion for all sorts of rea­sons. I imag­ine it would be a lit­tle like grow­ing up with­out see­ing Star Wars in the 1970’s, which I did. It’s doable. Not always fun. But you even­tu­al­ly absorb enough of the sto­ry to get along…. As for me and mine, we’re awful­ly glad to have been a part of the Har­ry Pot­ter hoopla. The kids will remem­ber that they read these books with Dad, and that Mom, in fact, nev­er real­ly read past #3. (Shock­ing, yes!) We’ve enjoyed the audio­books (Jim Dale is amaz­ing!) and the movies, as well. But those heady days when near­ly every kid and many of their adults were read­ing the same book at the same time…well, that was the best part, I think. Will we see that lev­el of excite­ment and ener­gy around a book series again? I don’t know. But I’m glad to have been a part of it this go around. We Need Longer Picture Books, Too! Loved this episode of RRB! When my kids’ old­er cousins intro­duced Har­ry to my old­est when he was 5, I had the ben­e­fit of my sister-in-law’s wis­dom and insight (skip over any­thing you’re wor­ried about, it will be fine). My fam­i­ly has loved these books; and I still re-read every sin­gle one in order as a kick off to sum­mer vaca­tion! The best book launch par­ties we’ve ever been to were spon­sored by North­ern Lights Books in Duluth for books 6 and 7 (yes, we planned a vaca­tion to Duluth to be at that par­ty) at the Depot Muse­um: high school chem­istry stu­dents ran the potions class, a won­der­ful seer could see from her mind to my mind, a wild ani­mal rehab spe­cial­ist brought in a tiny owl, you need­ed to know a pass­word to get in past the Fat Lady, and on and on — the details were astound­ing! Won­der­ful mem­o­ries, Karen! And good advice from the sis­ter-in-law. We’ve been lucky to have kids in this place and time, I think. 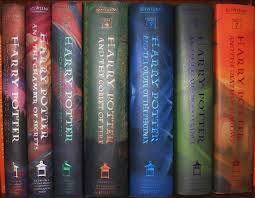 Look­ing at your pho­to of the book spines, the books got “fat­ter” around Book 4, didn’t they? A lot of adults I know lost inter­est then. I lost my sense of won­der­ment: Book 4 changed things for Har­ry and the gang and read­ing them wasn’t a breath­less expe­ri­ence of joy. Har­ry grew old­er, I grew old­er, the books grew fat­ter, and things changed. It felt like grow­ing up again, which is some­what the point, I guess. So glad you and your fam­i­ly took such a mea­sured approach to read­ing the Pot­ter canon. It’s cul­tur­al lit­er­a­cy in a good way. I noticed the same thing, Vic­ki. Maybe that’s why I didn’t make it past #3! But I think the fat­ness of the books was part of the enthralling thing for kids–they loved car­ry­ing around those huge books, stay­ing up all night to read them etc. We just start­ed the who-knows-what-num­ber lis­ten of DH this evening, imme­di­ate­ly on the heels of con­clud­ing HBP. I can’t imag­ine not com­plet­ing the series and audio book is an excel­lent expe­ri­ence if the paper ver­sion seems daunt­ing. We enjoyed the film adap­ta­tions, but much was lost from the sto­ry to pack­age them for the screen. Much is ALWAYS lost on the film adap­ta­tions, of course. I agree whole heart­ed­ly on the audio book ver­sions. Sounds like you and yours are huge fans! Enjoy the next go-trough! I have fond mem­o­ries of the four of us squish­ing togeth­er on OUR Child #1’s bed to read aloud from HP books…and sprawl­ing on the floor of our liv­ing room, lis­ten­ing to Jim Dale audio record­ings on CD which we bor­rowed from our pub­lic library…and watch­ing road trip scenery float by as we lis­tened to audio­books in the car. As a fam­i­ly, we attend­ed the mid­night book release par­ty for Book #7, and have seen all the movies togeth­er. I agree that it is a great thing to have par­tic­i­pat­ed in such a large-scale “com­mu­ni­ty read”–but aside from all that, it has just been a great thing to share as an ele­ment of our fam­i­ly fab­ric! Indeed, Deb. It’s inter­est­ing to think of the books that make up a “family’s fabric”–love that term.